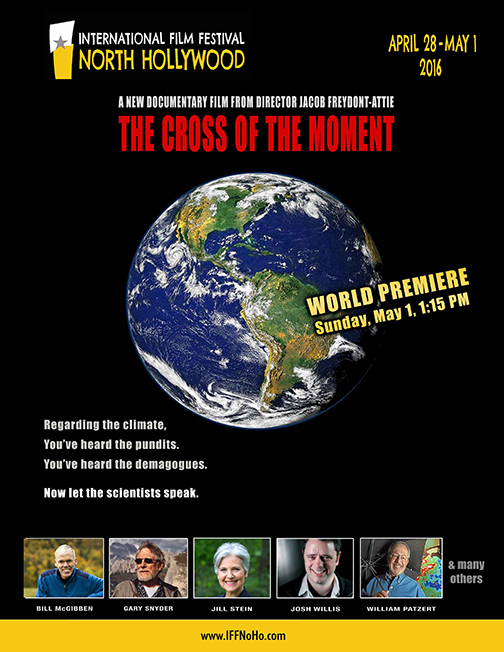 Welcome to The Cross of the Moment, a documentary film on the environmental crisis. 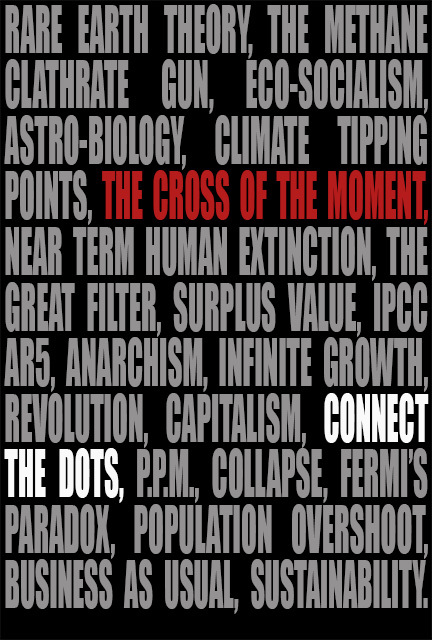 A deep-green, deep-time discussion of the environmental crisis, The Cross of the Moment is a feature length documentary that attempts to connect the dots between Fermi’s Paradox, climate change, capitalism, and collapse. Interviews with top scientists and public intellectuals are woven together into a narrative that is challenging, exhausting, and unflinching. The film is essentially an 80 minute constructed conversation among a group of highly informed experts on the most important topic in human history; will our species survive catastrophic climate change? One aspect of the film viewers find challenging is the withholding of the interviewee introductions until the end of the film. Ultimately, this is not a film just about climate change, but also about grand philosophical questions like the fate of civilization, the nature of our political/economic systems, and the very reasons why humanity exists. These are topics beyond the realm of academic authority, ideas upon which we all desperately need to engage . While watching this film we want viewers to concentrate solely on the moment; what is being said and the passion and belief of the speaker. In the end, when the introductions do finally arrive, hopefully viewers agree that the interviewees are indeed worthy of their attention. However, it is no secret whom the interviewees are, and, if you feel the need, you can watch the introductions first right here! As of May 2016 the film has been watched over 26,000 times on-line at Vimeo. It is also featured on many documentary, environmental, and politically oriented websites including Films for Action, Top Documentary Films, DisInfo, and Documentary Storm. The film is also available for public showings and for academic use. The film is always free to watch on-line, please share it with friends. For more information please contact Jacob Freydont-Attie.